Anyone who knows me well and my method of working on a new jewelry piece knows that I refuse to rush things. This last piece has proven no differently. I remember arguing with my teachers as a metals’ student, thinking that a piece that I felt strongly about producing completely from scratch was something that should be worthy of the time it takes to produce a work of “one-of-kind art” – and not what one of my dearest friends in college referred to as “slapping a project together.” This ideology has stood a long time with me. Using motifs from the history of decorative arts, I chose to return to using chasing and repoussé in sterling silver. 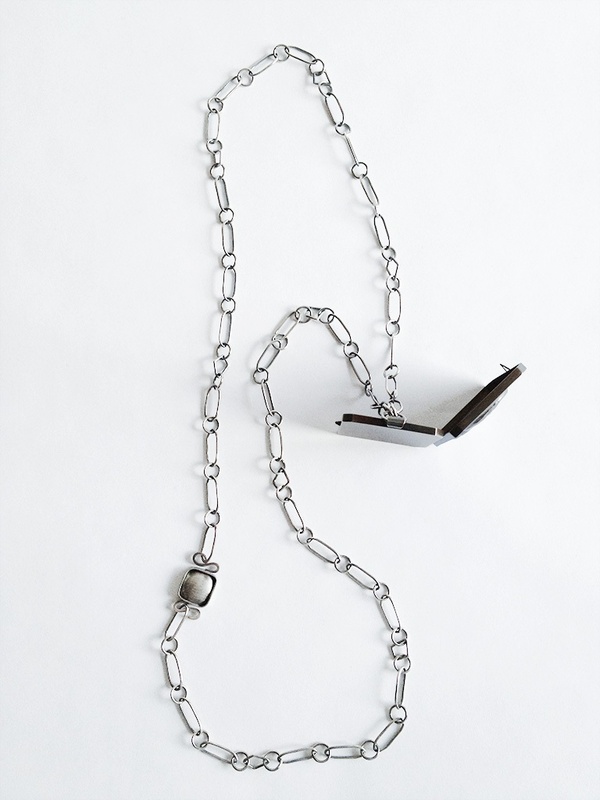 I incorporate a completely handmade sterling chain, clasp and hinge, referring back to the Victorian practice of placing meaningful items into a locket as a “homage” to loved ones. However, despite the Art Nouveau-styled undulating curves of the chased cover, I’m picturing the modern-day version of this wearer to be reading and receiving news from digital sources via smart phones and computer widgets. As an example, why can’t the current-day vision of an ideal be a Vanity Fair reader concerned about Hillary Clinton’s art advocacy? Or better, just like an Art Nouveau-era intellectual may have been concerned with progress, now in the twenty-first century we are worried about our typing skills becoming “a dying art” in the age of the almighty smart phone. As a true advocate of social media, I have two Facebook accounts, one that is dedicated only to the work discussed on the artdoesmatter blog and my own metalwork. I type on my phone or iPad constantly – and only turn a larger computer on primarily when I need to design something in Illustrator or Photoshop. Mobile accessibility in the tech world has revolutionized us; typing on an old-fashioned keyboard is an activity soon to be mourned. As discussed in a previous post, I design and typeset the two-dimensional interior news’ widget piece in Illustrator and draw out the decorative motifs that I chase and repoussé in silver. The 2-D graphic piece is printed in color on archival paper and set inside behind clear plexiglas that I hand-saw and polish to snap-fit into the octagonal-shaped oxidized silver locket body. Because I use materials like metal, paper, acrylic and sometimes fabric in my work, each jewelry piece becomes more of a mixed media composition that’s actually a wearable container for our recollection of soon-to-be-outdated technology. All images, creative concepts and objects pictured in this blog entry are copyright-2013 Patricia Sullivan / artdoesmatter and may not be used or duplicated without my permission. Soooo, beautiful! The chains alone are stunning. Thanks so much, Laura. I’m loving following your blog and work. Your last post of that huge outdoor kiln firing was fantastic! Thanks so much for stopping by and commenting. I enjoy reading your blog about various artists but I enjoy it more when it is your work! Now go slap some more pieces together! Amy!!! How did you remember that from so many years ago in school!! I’m so happy that you stopped by and said hello. I often think of many our talks and it always makes me smile. Hope you are doing well, and thanks for the nice comments about my blog! Patricia, your exquisite time consuming craftsmanship (from scratch no less!) is stunning on its own. Then paired with something so instantaneous and negligible as words from the internet is a very interesting concept to me. I love the concept and execution. I’m also starting to feel so left behind… no Facebook page, no iPhone, no iPad. I still do everything on ye old computer! Anita, your interpretation of what I’m trying to say w/this piece is spot-on. I’m taking my (near) obsession with Victorian jewelry and trying to bring that forward into modern-day tech-times. Though you say you don’t use FB or iPad/iPhone – you DO write and create a stunning blog about your painting. That is even more “tech” and forward-thinking to me than FB or Twitter etc. And since I draw out my pieces in Illustrator before I make them – I have to boot up the old computer too! Thanks again for leaving such a great commentary on my work and for your lovely visit to my blog! I do like this, both in concept and execution. I wonder if you would agree starting the making as far back as possible, and doing so to the highest possible standard of craftsmanship, is characteristically American? Many years ago when we sailed a lot, I read a delightful book by an American who had built his own boat on the same principles. For example, I’d just bought a plastic wash-basin for my boat from the store. This man had cut a tree, seasoned the wood, cut it, glued it, carved and shaped it, to produce the most beautiful varnished wooden basin. I have, since then, come across other instances. Maybe it harks back to the pioneer spirit, the pioneers moving West just ahead of Walmart so nowhere to shop – if you needed, it you had to make it. Maybe I’m wrong, but I’ve never come across such an exquisite style of craftsmanship in the UK. We are all in too much of a hurry here. Pete, your ideas are fascinating here. My husband is a bit of a boating “hobbyist” – so I know exactly what you’re referring to in this case. To say that it is American to be concerned w/stellar craftsmanship is what I would love to think is true – but I can’t forget how Walmart culture has infected that ideal that the colonists brought over to the US. However – there’s been an absolute rise in interest here lately to elevate the handmade item to a stature it deserves. I see many artists from the U.K. (like you) making such thoughtful work (esp. U.K. ceramic artists I’m noticing in the blog sphere). Lastly – you are so right!! Way too many creatives (worldwide in my opinion) are rushing things to finish; it’s the “slap a project together” reality. TY again for dropping in and leaving such great insights, Pete!! As Amy pointed out, as much as I enjoy reading your reviews of other artists, it’s great to see your own work Patricia ! Great concept, and your choice of repoussé – maybe the slowest, and most time-consuming technique there is ? – is perfectly suited to it. This is a beautiful technique isn’t it? You really have to work with the metal (listen to it too), not “fight” it, or shape it into submission. You’ve done it beautifully. Dominique, knowing how you approach your own work and seeing the gorgeous jewelry you’ve made, I’m so honored to receive your lovely feedback. I agree – repoussé IS the slowest technique there is. The constant flipping btw. sides of ea. piece, the annealing, planishing – the only positive thing is that ability to draw in the metal. I don’t think I’d be happy with other methods that I’ve seen work so well for other metalsmiths. I’m so very happy you stopped by to comment; I love hearing your perspectives as a fellow jeweler. Thanks Dominique! 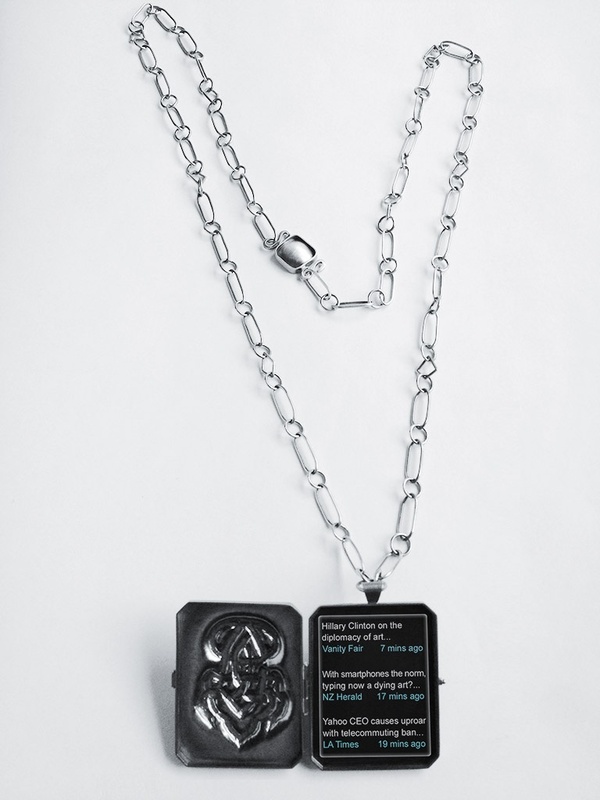 The necklaces are a fascinating social commentary that somehow simultaneously echoes the past and whispers the future and at the same time is a really lovely piece of jewelry. Sharon, what a great synopsis you’ve just handed to me for my artist statement – I love how you always have such a succinct way of describing my metal work (as well as the other artists’ work I present on here.) Thank you so much for your lovely and positive reinforcement, and of course, for your welcomed visits to my blog! Thank you and I am very pleased. Gorgeous pieces, Patricia. I love how you took such an abstract concept as our growing dependence on smart phones and channeled it into wearable art. Nicely done! Gina Marie, thanks so much for the lovely feedback. I’ve been working on updating my artist statement today (seems how we always seem to need one and it’s best to have it “ready and waiting”.) I feel like I should “lift” your comments here and place it w/ Sharon’s above to create such a clear synopsis of my artwork. I genuinely appreciate your valuable comments!! What magical words ‘repousse’, ‘planishing’, ‘chase’. The delicacy and refinement of your work is a far cry from slapping something together! I do remember the dreadful midnights before projects were due, when for me slapping something together (usually making repairs) was a panic-ridden necessity. Your work seems assured and polished. I enjoy reading the exchanges too. Lovely post Patricia. Great to see your work again. Philippa, your wonderful comments are very flattering, since you create such exquisite and sensitive artwork yourself! I’m chuckling to myself (again!) about the “slap a project together” method of working; I think the “hilarious-ness” from rushing and stress factors can occur simultaneously before deadlines, for any artist. Thank you so much for your very thoughtful insights and for your visit! Have to say that my dear old dad didn’t sleep well, so in my art school days he often helped me glue unlike materials together at midnight! He was unflappable, thank heavens while I was in silent screaming panic. I am interested to hear that in those days you were quite clear about your approach and your need for time, despite external pressures. Well done (then and now)! Dawn, thanks so much for stopping in and for your nice comments. The clasp is a totally new design for me – I call it my “bread loaf” clasp – because the shape now reminds me of a slice of bread. I wanted a rounded organic square – I’m so chuckling to myself! Appreciate your feedback and visit! Oh that’s very flattering of you to say, Eva! Best of luck to you as you continue with your jewelry/metals’ study. It must be lovely to be living and studying in Ireland. I appreciate your nice comments and your visit to my “artdoesmatter” blog. Sharon, thank you so very much for nominating artdoesmatter! That means so much, especially coming from another blogger like you, whose own work and writing I enjoy so much. I appreciate the lovely compliment!! Don’t know much about art, but these pieces are pretty. That is very kind of you to say, Steve! Thanks so much for your visit and for the positive feedback on my artwork! Beautiful piece! That’s something I have yet to try myself, making a locket. Thanks so much, Maria, for the ‘Like’ and your nice comments! You’ve got quite an interesting blog going there – enjoyable reading! Thanks for stopping by and saying hello. I really appreciate the beautiful repousse work you have done, it is also something I really enjoyed but haven’t gotten round to doing much of as yet. Well done, looking forward to seeing some more of your work. Thanks so much, Dorothy – I really appreciate your very generous compliments re: my work, especially from a fellow jeweler like yourself whose lovely work I appreciate and enjoy reading about so much. I’m so happy you stopped in to visit!